Stainless steel refers to a class of iron alloys that are built to be corrosion resistant for a particular environment. They can contain a range of metals including nickel, molybdenum, and titanium. Stainless steels have been categorized by the Society of Automotive Engineers based on their compositions. These categories are known as the SAE steel grades and for stainless steel each category is referenced by three numbers. 420 and 440 stainless steel are both iron-chromium alloys, but they have slightly different mechanical and electrical properties making them suited to different applications. 420 grade stainless steel has a composition of 12 to 14 percent chromium, 0.15 percent carbon, 1 percent manganese, 1 percent silicon, and tiny amounts of phosphorus and sulfur. 440 grade stainless steel has higher amounts of chromium -- 16 to 18 percent -- and carbon at 0.6 to 0.75 percent. This slight variation in composition leads to different mechanical and electrical properties. Tensile strength is a measure of the pulling force needed to break a material. The tensile strength of 420 grade stainless steel depends on its heat treatment temperature. Generally, the lower the heat treatment temperature, the higher the tensile strength. For example samples that are heat treated at 204 degrees Celsius (399.2 degrees Fahrenheit) have a tensile strength of 1,600 megapascals, whereas those heat treated at 650 degrees Celsius (1,202 degrees Fahrenheit) have a tensile strength of 895 megapascals. 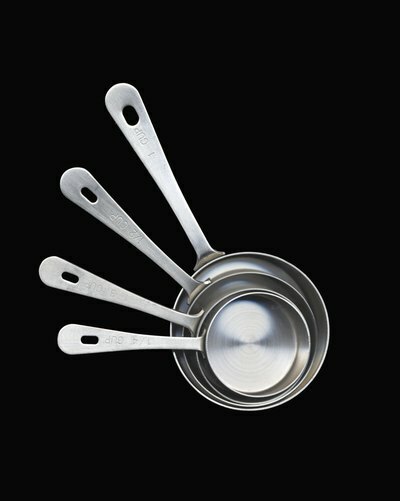 420 stainless steel is used to make items such as cutlery, where the tensile strength is not required to be very large. The tensile strength of 440 grade steel also decreases with heat treatment temperature. However, the magnitude of the tensile strength is greater, with a peak value of 2,030 megapascals at a heat treatment of 204 degrees Celsius (399.2 degrees Fahrenheit). 440 grade steel is therefore better suited to applications that are more physically demanding on the material. For example it is used in the fabrication of chisels and surgical instruments. Stainless steels are often used in applications where the electrical properties are also important. For example, they are used in the fabrication of electronic valves, electro injectors and electromagnets. The particular type of electrical properties required depends on the specific application. Resistivity is the fundamental electrical property that is used to define the electrical properties of a material, and is a measure of how much a material impedes electron flow. 420 grade stainless steel has an electrical resistivity of 550 nano-ohm meters at 21 degrees Celsius (69.8 degrees Fahrenheit). 440 grade stainless steel has a resistivity of 600 nano-ohm meters at 21 degrees Celsius (69.8 degrees Fahrenheit) . This means that both types of stainless steel are relatively good conductors, although not as efficient as copper. Where electrical applications crucially require a lower resistivity, 420 grade steel should be used.